The Church of Jesus Christ of Latter-day Saints, whose members are sometimes nicknamed Mormons, have been a part of the Boy Scouts of America since 1913. The program is seamlessly mingled with the weekly activity program for boys. Children and teens eight and older meet one night a week for activities that combine religious training with practical application. For boys, this program is usually carried out through the Boy Scouts of America. The girls have a church-developed program. In countries where the Church elects not to use the Scouting program, the boys utilize the girl’s church program, which is sufficiently generic so as to be personalized to the needs of any nation, gender, and culture, as well as to the desires of the leaders running the program. The Boy Scout program emphasizes those skills and qualities the LDS Church strives to promote in its youth. The program teaches the boys to have high moral values, to serve others, to expand their horizons, and to set and achieve goals. The Church make some adaptations to the program and do not have a Tiger Scouts program, but in general, it follow the established program. The Cub Scout program operates through the Primary, which is the official children’s auxiliary. The program is overseen by the female leaders who run the Primary, but the leaders working with the children may be either male or female, with two leaders assigned to be with the children at all times for safety. When they graduate into Boy Scouts, the program is run under the Young Men’s program, where all leaders are male. Again, at least two leaders are required to be with the youth at all times. Within the program, young men set goals in a variety of areas that widen their range of interests, allowing them to find out where their talents and passions are. They gradually increase their ability to carry out these goals, culminating in a large service project which they plan and carry out, directing others who volunteer to help. In a church that is volunteer-led, this teaches critical leadership skills that serve the boys both in church and in their personal and professional lives. Mormons and Scouting work together to teach the youth to live lives of service to others. Throughout their years in Scouting, Mormon Boy Scouts are expected to participate in and carry out a variety of service projects for their faith and also for their communities. 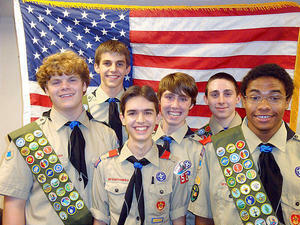 In 2011, Mormon-run Boy Scout troops were approximately one-third of the organization’s troops. Nearly every congregation has one, although many are smaller than average, since they are largely comprised of the boys who are in that congregation and a small number of non-Mormon friends. This page was last edited on 26 June 2013, at 09:06.